Believed to have been first built in Roman times, it was originally made of wood. After being destroyed by a flood in 1333 it was rebuilt in 1345, this time in stone. 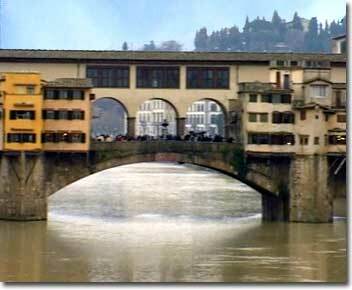 All of Florence's other bridges were demolished during WWII (and have since been replaced), but the Ponte Vecchio survived as even the Nazis could not bring themselves to destroy it. Most of the design is attributed to Taddeo Gaddi. The bridge consists of three segmental arches, the main arch has a span of 30 meters (98 feet) the two side arches each span 27 meters (88 feet). View of the Ponte Vecchio from aboveIn order to connect the Palazzo Vecchio (Florence's town hall) with the Palazzo Pitti, in 1565 Cosimo I de Medici had Giorgio Vasari build the famous Vasari Corridor above it.